Is there anything better than finding a man with a huge bunch of flowers on your doorstep on Valentines Day? I love Valentines Day and I'm not afraid to say it. 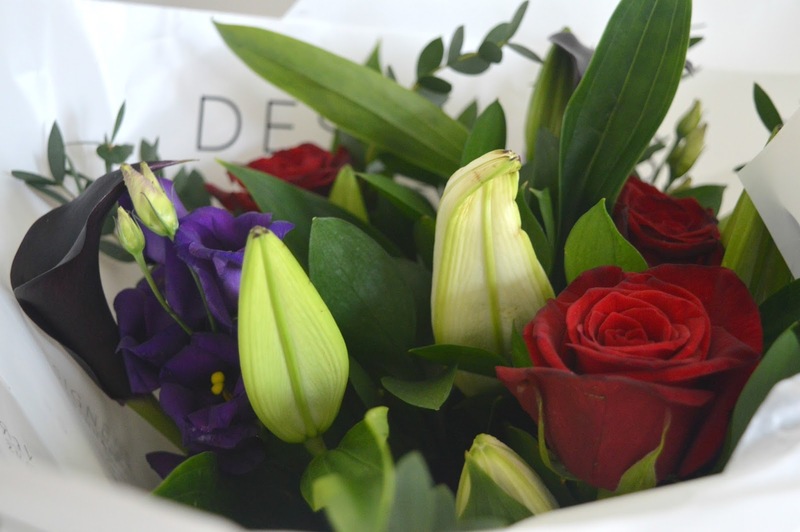 I know that many feel it's a bit of a con, and whilst I do agree that you should show someone you love them every day of the year, there is something rather lovely about getting a bouquet of flowers from your loved one on 14 February. 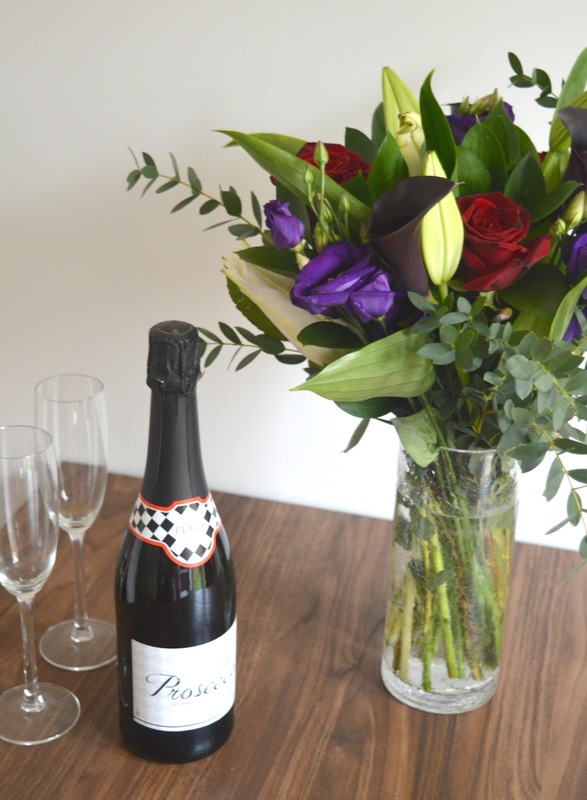 Our first Valentines together, I was still living in London and Simon was up here in the North East and he arranged a beautiful vase of red tulips (one of my favourite flowers) to be delivered to my office. It was the first time anyone had ever bought me flowers me on Valentines and it's a moment I don't think I'll ever forget. This stunning bunch of flowers was delivered to me by Debenhams Flowers, as an early Valentines. The "Designer Passion" is a gorgeous bouquet of rare black calla lilies, deep red rhodos roses, purple eustoma and oriental lilies, which would make the perfect gift for a loved one on Valentines Day, it's a great alternative to a bunch of roses. They arrived really well packaged in a huge protective box and once I'd ripped away the packaging I was really happy to discover the flowers were in water and sitting in a gift bag with long handles meaning easy transportation from the office to home - even if you have to do battle with a bus or train. The flowers arrived in bud form, ready to bloom and there are lot of tips on the Debenham Flowers website to keep your bouquet looking beautiful - from creative vase tips to how to make your flowers last (essential if you're like me and don't have a clue!) They are also guaranteed to stay looking beautiful for 7 days if not, you get your money back! Debenhams Flowers have a wide range of Valentines Flowers to choose from with prices starting from £15.99 for a single red rose and many of the flowers coming in a gift set to include chocolates, a cuddly bear or a balloon. 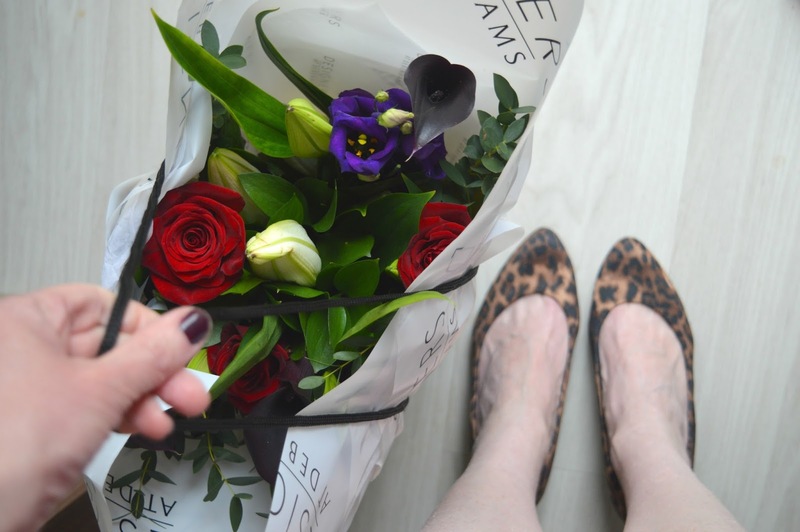 If you love the Designer Passion as much as I do and fancy buying your other half flowers from Debenhams Flowers I have a 25% discount code for all New Girl in Toon readers. Just use the code "DFBLOG25" to receive your discount. The good news is the discount wont expire, so make sure you remember it when Mothers Day rolls around! Keep your eye on my Instagram as I'm sure I'll be posting some more photos of my bouquet as the flowers begin to open. It may be cheesy but you really can't beat flowers as a lovely gift. I love tulips the best!